Sioned Dafydd is a presenter for Swans TV. Swansea City may currently have slipped off the pace in the Championship, but the club are front-runners in Wales when it comes to live streaming of matches. Swans TV have been showing live coverage of games – to both a worldwide and UK subscription audience – dependent on rights restrictions. 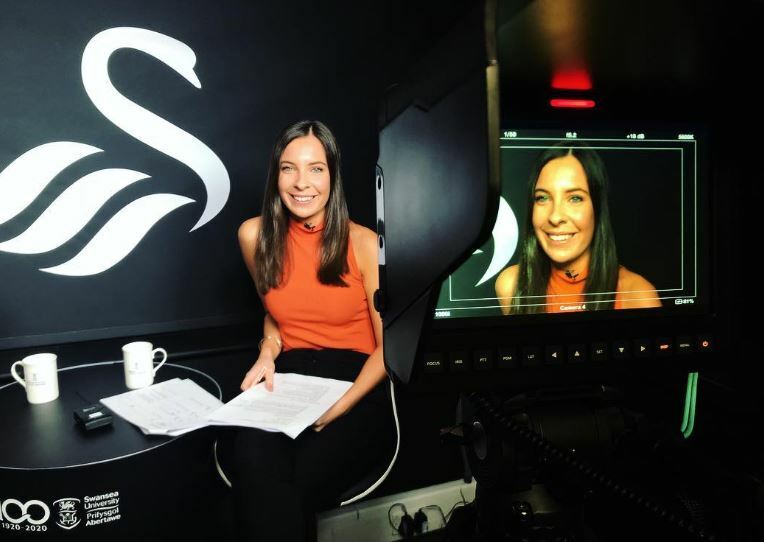 Swans TV Live presenter Sioned Dafydd outlines her own role in the club’s recently launched streaming service. I was eight years old when my father took me to my first Swansea City match. It was a League Two clash down at The Vetch against a struggling Grimsby Town side and I’ll be honest with you, I hardly remember it. I can vaguely recall walking through those tiny turnstiles and my Dad holding my hand as we made our way through to the stands. I do remember “Kenny Jacket’s Barmy Army” being sung on repeat and being amused when Cyril the Swan came over and gave me a high five. Everything felt so new, so big and so unfamiliar to me but little did I know at the time how much of a big part Swansea City would play in my life and my career. Fast-forward 14 years and I’m sat at The Liberty Stadium in a little studio in the top left-side corner of the West Stand. Not many fans know it’s there, but that’s where I am now for every game when I present ‘Swans TV Live’ – the club’s ground-breaking coverage of Swansea City’s games in the Championship. It’s a live match day show with pre-match, half-time and post-match studio chat with me and a pundit, as well as the full game itself with local commentary, replays, graphics and a multi-camera service. It’s certainly a development that’s unfamiliar to some fans and it was unfamiliar to all of us who work at Swansea City at the beginning. The whole thing only got given the go-ahead around five weeks before the opening game of the season, so you can imagine the stress of having to put together a brand new live show in just over a month, especially when the club had never done anything to this level before. The club have invested heavily in the new equipment and fans from all over the world are paying to watch the show every week. So, this was something we had to get right. In the early stages there was a lot of nail-chewing and a good deal of coffee to keep us going. There were also a few hairy moments as we all got to grips with the beast that is live television. But, like anything, practice makes perfect. We’re almost halfway through the season and I’m so proud of everyone who works on the show, when I look back at how far we’ve come since that very first game of the season when the Swans were away at Sheffield United. I’m even more proud to be a part of a team that’s made history by producing something never done before by Swansea City. So what does a typical match day entail for all of us involved with the Swans TV Live show? I’m sorry to disappoint you but there’s no juicy gossip, or scandals or diva demands from our guests. It’s a brilliant environment to work in as we’re all striving for the best production possible. Former Swans star Leon Britton chats to Sioned Dafydd. For myself the day usually starts off with a (very large!) coffee and as I arrive, with the rest of the crew, at around 10am. Then it’s a look through the running order that I’ve prepared the day before. That’s when I make sure the timings and links between the different segments are in place and rehearsed. A half-hour pre-match show doesn’t sound that long, but we usually struggle to squeeze everything in. The media team at Swansea is so talented that I want to show everything they create. Then, it’ll be prepping and scripting time for me when I can usually be seen typing away on my laptop for an hour or two scripting my lines, questions to my studio guests and jot down a lot of stats about the game. In the meantime, that’s when the multimedia boys are collecting all the pre-match content that includes a pre-match interview with manager Graham Potter as soon as he arrives at the ground. This is the sort of content that isn’t available anywhere else. We also always have a camera ready for post-match flash interviews with players and coaching staff that allows us to show exclusive content live to supporters. It’s that aspect of it that makes it unique. It’s insight only Swans fans can get when they watch the game live on Swans TV Live. By then, the morning has usually flown by and we find ourselves about an hour away from going live. It’ll be a quick change for me and I’ll do my hair and make-up in the ladies toilets in the stadium (and you thought working in television was glamorous…!) Then our studio guest will arrive and it’s show time. A frustrating game yesterday to say the least but it was great having @krisoleary4’s company in the @swansofficial studio once again. We’ve had the likes of Leon Britton, Lee Trundle, Kristian O’Leary, Andy Robinson, John Williams, Adrian Forbes and Cameron Toshack providing analysis of the action as our pundits. I have to say, they’ve all been a dream come true to work with. I grew up watching most of them playing for Swansea when my Dad first started taking me to watch. When I think back to that first game at The Vetch against Grimsby Town, Leon Britton, Trunds, Andy Robinson, Adrian Forbes and Kris O’Leary were all in the squad that day. Now, as a part of my job, I get to sit and talk about the Swans with the players I grew up watching. I still find it bonkers. I’d like to say a big thank you to everyone at Swansea who has been involved in bringing Swans TV Live to life this season and who continue to push boundaries to make the show the best it can be. We are a small team, but it’s an exciting venture because I think streaming is an area that is only going to grow in football. Hopefully, Swans TV Live is only going to get bigger and better.